Furthermore, the fact that there are only 12 players on the squad enables the coaching staff to devote more time teaching some of the more inexperienced players the nuances of the game. “A lot of our team are swimmers, so they’ve just come off a season of being in really good shape,” Phillips added. “And most of the others have been swimmers in the past, so they know how to condition their body in that way.” This high level of endurance and fitness has been crucial in a schedule that featured a Spring Break trip to two tournaments in two states, all in a 10-day span from March 15-24. The Scots struggled to a 0-8 record in the 3Cal Baptist Tournament, which served as the team’s first Spring Break stop. The team played against elite competition in this six-day event (March 15-20), losing games to Division 1 Iona and Virginia Military Institute by a combined 32-7 score. Charlesworth pointed out that such schools are at an inherent advantage, as they are able to award athletic scholarships and “other recruiting advantages that allow them to pull from a wider base of athletes.” Despite Macalester’s recruiting limitations, the coach said she still found great value in the tournament. Even though the team may have been a little overmatched in the tournament, losing all of their matches by four goals or more, the players seemed to share their coach’s assessment. Harrington-Abrams said she believes that the high skill of these opponents will make conference play much less intimidating. The tournament was also a homecoming of sorts for many Scots, as half of the team hails from California. This high percentage of players from the Golden State is not a coincidence, as the team schedules a trip to California each Spring Break to help with recruiting. Right after wrapping up the Cal Baptist Tournament, the Scots hopped on a plane and flew to Erie, PA to compete in the CWPA Tournament (March 22-24). Macalester experienced a lot more success in Pennsylvania than they did in California, finishing the three-day tournament with a 3-3 record, all against conference competition. 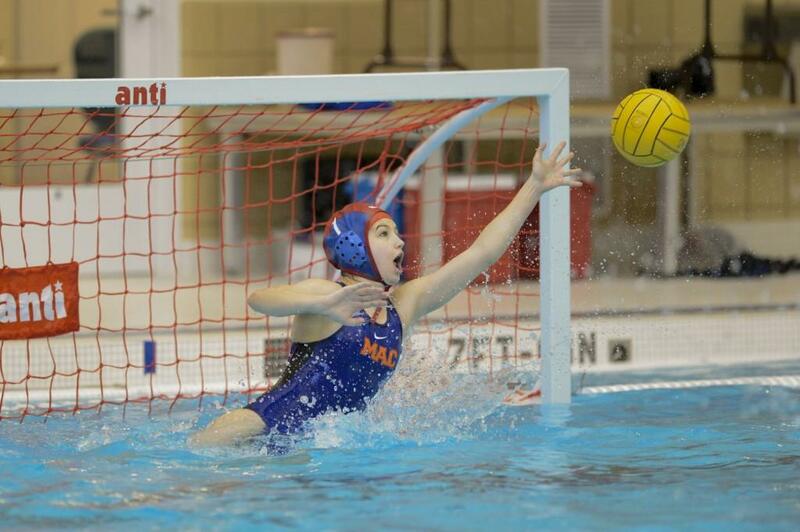 Although Macalester is traditionally a MIAC school, the Scots are a part of the Collegiate Water Polo Association (CWPA) because the MIAC does not have water polo. After dropping their first game against Washington & Jefferson (PA) 12-4, the Scots proceeded to win three of their next four matches by an average score of 11.3 to 5.3. Utica (NY), Penn State-Behrend and Carthage (WI) were all victims to the Scots’ sudden surge in scoring. Despite the improvement in record, Harrington-Abrams felt like the team could have done more. “Even the games we lost we felt like we could beat those teams,” Harrington-Abrams said. Indeed, the Scots lost by three-goal margins to Grove City (PA) 11-8 and Connecticut College 10-7. Had a few more shots gone their way against these two opponents, the team would have finished the tournament with a 5-1 record heading into this weekend’s CWPA/Carthage Tournament. That said, there were certainly many positives to be taken from this tournament. Utility player Sarah Shoemaker ’15 (Saratoga, CA) scored 16 goals in six games, while center-forward Adrienne Burgin ’15 (Walnut Creek, CA) added another 15 goals. Furthermore, the team averaged 8.8 goals a game in Erie, up from their 5 goals a game average they posted in California. The team next travels this weekend (April 5-7) to Carthage, WI, competing in their third tournament of the year. In light of the team’s recent successes, Charlesworth is confident that the Scots can put together a good showing against the same conference teams they played in Erie. The team’s first tournament match is against host Carthage on Friday, April 5.